It shouldn’t come as a surprise that members of the New York Road Runners staff love to race. We cross finish lines all over the world, at all distances and all paces. And like all of you, we race for a variety of reasons—to have new experiences, chase goals, raise funds for charity, or simply for that endorphin high. Some of us are new to racing, others have pinned on a bib many times. Check out just a handful of our race experiences in 2017. We’ll be sharing more in the coming year, and we’d love to hear your success stories, too. "I never considered myself a runner, because I thought I had to be fast. However, this spring and summer I ran at my own pace. I realized consistency is key and I became faster, stronger, and more confident. I wanted to run my first 10K, the NYRR New York Mini 10K, with my best friend, Melissa, who was visiting from Trinidad. Though I had a love/hate relationship with the hills of Central Park, Melissa was a major support, and together we did it! And even before we grabbed lunch that day, I told her I wanted to run the NYRR Queens 10K the next weekend—and I did! I was so proud of myself. My best race this year was the New Balance 5th Avenue Mile. I ran this race in 2015 and finished at 8:15. This year I finished at 7:05. I want to join the Strava challenge to run 1,000 miles in 2018. I can’t wait!" Ben also ran the NYRR NYC 60K, completing the 37.2-mile distance for the fourth year in a row and setting a personal-best time of 6:38:24. WOW! "In 2016 I ran The Coney Island Turkey Trot 5K on Thanksgiving. I’d been a middle-distance runner growing up, but I’d had a long layoff. Getting back into running as an adult, I worked up to 5K-running that distance made me feel empowered. I felt strong in the Turkey Trot, but my balance was off—I stumbled a few times. The next week I was at work and suddenly had a terrible headache. I went to an urgent care facility and my blood pressure was through the roof. They got it under control, but the next week I was on the phone with a girlfriend and I remember her telling me to hang up and go to the emergency room. An MRI showed I’d had a stroke. I was in the hospital for five days. I had months of physical therapy. In the spring I started running again, very gradually. I got a lot of support from my coworkers and from the running group I started, We Run Brownsville. By summer I wanted to do a 5K. 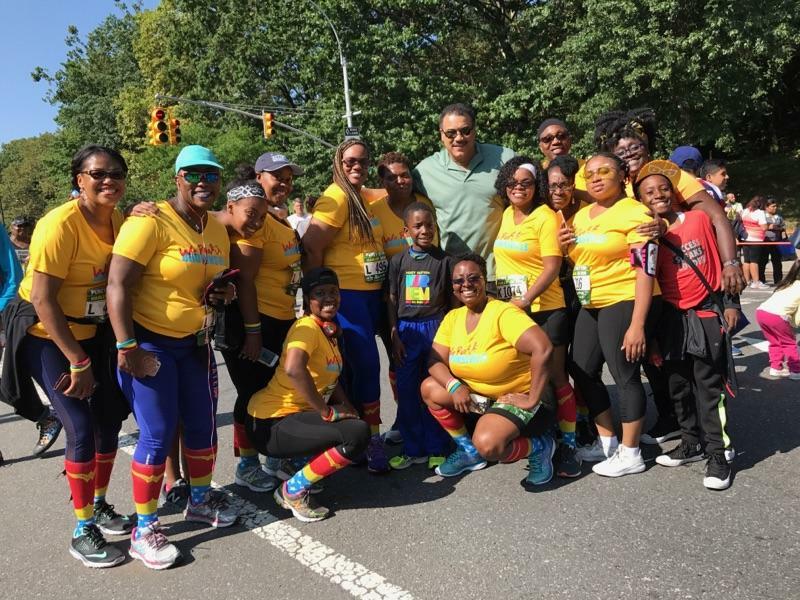 I picked the Percy Sutton Harlem 5K Run because many of my coworkers and teammates would be there. The race was not easy—I had to work very hard on the hills. Finishing was so overwhelming and so complete for me. My team has a philosophy of never giving up and always waiting for the last person to finish. That was what kept me going—knowing that my teammates and coworkers would be waiting for me. I know that if I weren’t a runner, the stroke would’ve been a lot worse. I give running all the credit—it truly saved my life." "As a former sub-elite runner, I’ve accepted that my personal records are in the rearview mirror. I now want two things—to challenge myself physically in ways I haven’t before, and to create unforgettable experiences. I’d always wanted to go to the Grand Canyon and this year I thought, Why not see it all? I peer-pressured a few former college teammates, studied up, and ran across the Grand Canyon...and back. Rim-to-Rim-to-Rim (R2R2R) is an ultrarun that covers a roundtrip distance, South Rim to North Rim. Our excursion was a 47-mile day covered in approximately 13 1/2 hours. The distance is not even the most challenging aspect. It’s the change in elevation—a staggering 20,400 feet. That’s essentially going up and down the Empire State Building 14 times. It was incredible to see the Canyon’s enormity and stunning natural beauty, to experience running deep in the middle of the Canyon with stars bursting through the sky at 4:00 a.m. Doing this with friends I have known for over 15 years was truly an unforgettable experience. We’re now hooked and—as insanely competitive people—looking to up the ante. Our next planned excursion: a 93-mile jaunt on the Wonderland Trail around Washington’s Mt. Rainier." "Usually I stick to shorter races. I ran both the New Balance 5th Avenue Mile and Abbott Dash to the Finish Line 5K for the second time this year, which were fun. In 2017, however, I decided to stretch it out a bit and ran the New Balance Bronx 10 Mile, which is the longest race I’ve run to date. I wasn’t sure how I’d do given the longer distance and warmer temperature that day, but after a few miles I spotted and tried to keep up with Ben Saah. I’m pretty sure I shaved at least five minutes off of my time just by trying to chase him down. I still joke about it whenever I see him. 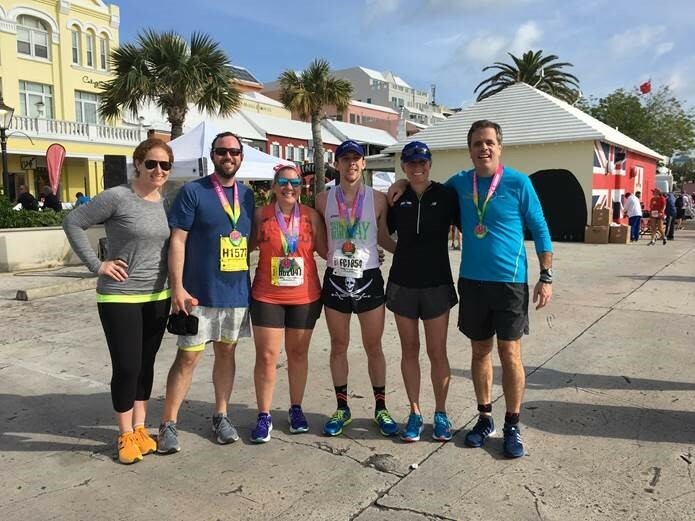 I’d have to say this was my most meaningful race of 2017, as it’s inspired me to plan to run some longer races in 2018, including a half and full marathon." L-R: Farrell, Forys, Doyle, and Scher at the 2017 J.P. Morgan Corporate Challenge Championship in Frankfurt, Germany. In 2016, NYRR won the men’s division of the J.P. Morgan Corporate Challenge in Central Park. 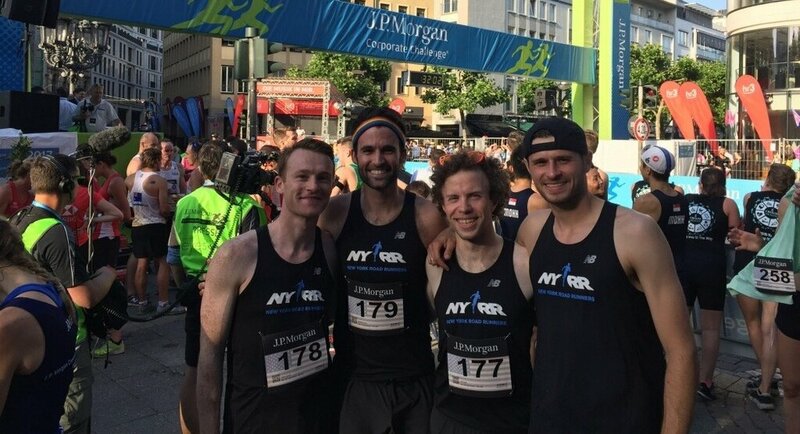 This June, our team of Ted Doyle, Brian Farrell, Matthew Forys, and Mike Scher traveled to Frankfurt, Germany, for the J.P. Morgan Corporate Challenge Championship. They competed against teams from around the world and again did themselves proud, placing fourth! The race was this an amazing opportunity to take part in a prestigious international event with top runners from around the world. Once again this year, dozens of NYRR staff took part in New York’s J.P Morgan Corporate Challenge in Central Park. We love having the opportunity to come together for an event that’s all about encouraging people of all ages and abilities to do something fun and healthy together. Inspiring us all, Michael completed his 26th consecutive New York City Marathon in a lifetime best time of 3:49:41. He came back two weeks later and completed his first ultra, the NYRR NYC 60K, in Central Park. Stay tuned for a recap of his experience in an upcoming post on The Run On!